Hailed as one of the first mainstream films about being a black gay man in today’s America, Moonlight by Barry Jenkins is a beautiful and melancholic tale that gracefully avoids stereotypes and predictable plots. Based in a deprived, black neighbourhood of Miami during the 80s and told in three parts, it’s the poetic and intimate story of a quiet boy who is different from the rest and can’t quite fit in. In the first phase, when he is only still known as “Little”, nine-year-old Chiron (Alex R. Hibbert) flees his drug-addicted mother Paula (Naomie Harris) and her toxic, unhomely household to find refuge at Juan (Mahershala Ali) and Teresa’s (Janelle Monáe). Juan, who, Chiron later finds out, sells drugs to his mother, picked up the boy as he was hiding from a gang and took an immediate liking to him. To Chiron’s mother’s disapproval, Juan and Teresa start acting as substitute parents, but the reason for their benevolence remains unclear. Kevin (Jaden Piner), an energetic, self-assured, little man, is Little’s only friend. 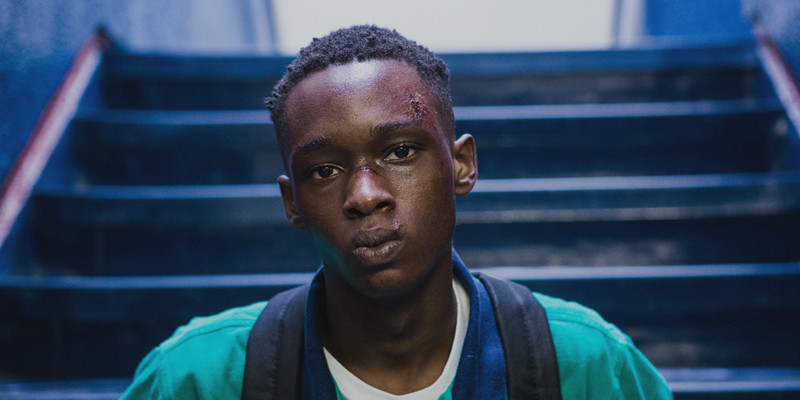 In part two, Chiron has grown into an awkward, silent sixteen-year-old (Ashton Sanders) who is teased at school and eats his canteen dinner on his own. He doesn’t have any friends but can still count on Teresa and Juan. While he is constantly made fun of and harassed by his violent schoolmates because of his different looks, he gets a much softer treatment from cool and outspoken friend Kevin (Jharrel Jerome), who has a lot of patience and understanding for him. One night as the two boys sit on a beach, they unexpectedly make love. Soon after, however, as Chiron was visibly brimming with happiness and love, Kevin is forced to beat him up by the school’s violent gang. In the third part, Chiron (Trevante Rhodes) has metamorphosed into a bling-bling, swaggering, beefy 20-something drug dealer, known as “Black”, full of confidence and running the show. He is finally getting the respect he has been denied all his life. But he has only managed to achieve this by burying who he is and there is a sense of profound sadness in him. He has no friends or family to talk about, except for his mother, who has now been placed in an institute and with whom he is trying to make peace. One day he receives a call from Kevin (André Holland), now a chef in a restaurant near Atlanta, who is calling to apologise for what happened years ago and asking to meet up. Chiron is dumbfounded by the call but doesn’t act on it. He carries on with his life until eventually he decides to drive up to meet Kevin, who turns out to be living a simpler, but much happier life. There is a lot of affection and tenderness in the encounter but time has passed and can’t be reversed. The simplicity of Moonlight’s structur, the delicate use of images over words and most of all, the excellent performance of all of its actors, help the viewer to focus on Chiron’s interiority and the suffering he is going through which he can’t put into words. Despite his trouble communicating and expressing his feelings, Chiron, through the three periods of his life, manages to convey the difficulties any teenager faces as they try to discover who they are meant to be. It’s a complicated path on which he faces rejection – from his mother and schoolmates – and receives unexpected acceptance – from well-wishers like Juan and Kevin – only to be sourly disappointed, resulting in him shutting himself off from others and himself even further. What is tragic is that to keep out of trouble, Chiron ends up having to refuse everything he is and embracing a culture of violence and superficiality that he loathes. When Kevin points out how flashy his car is when they drive back from the restaurant towards the end of the film, Chiron has to admit he has no idea why he has that kind of car, or how he’s turned into the gold-toothed massive thug he now appears to be. Less because of social predetermination and lack of opportunities in the area where he grew up, there is a sense that Chiron has chosen this path to escape who he is and prevent himself from suffering any more. Moonlight’s measured pace, simple action and beautiful yet simple photography lend a sense of universality to the film. It’s not the story of a gay black boy after all, it’s a life’s story that can apply to anyone. It’s a heart-breaking lesson that once again, happiness is about being true to oneself, and that to love, one must first learn to love oneself. Corny, but true, uh? Such an beautiful film. I hope it wins best picture and that it’s brilliance, it’s message are not overshadowed by the politics and hoopla of Oscar voting.